Hospitality Business has a cumulative reach of more than 86,900 to New Zealand’s key hospitality and foodservice purchasers and influencers every month! The hospitality market is one of the best-performing sectors of New Zealand’s economy, worth an estimated $18bn annually and growing fast – and Hospitality Business aims to help readers take advantage of the opportunities and keep abreast of the challenges the sector presents. 11x per annum we feature news analysis, comment from industry experts, case studies and coverage of all the latest trends, the title is a one-stop shop for those wishing to retain a competitive edge in this fast-moving industry. Hospitality Business also has a dedicated online presence at www.hospitalitybusiness.co.nz and supported by weekly e-newsletters to the wider hospitality industry. 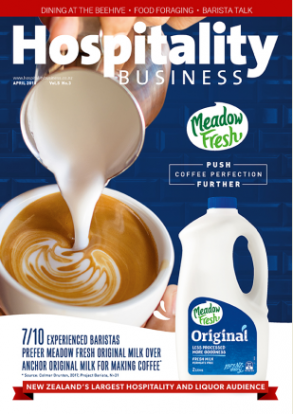 Hospitality Business leads the New Zealand hospitality and foodservice market with unmatched audience figures every month, no competitive magazine gets close! Hospitality Business features market-leading editorial by industry experts and managed by Editor, Kimberley Dixon. With extensive publishing experience, Kimberley is dedicated to bringing news and information to assist hospitality businesses grow and succeed. She is supported by leading contributors and photographers across New Zealand, Australia and the world. The Shout also features its own regular fortnightly e-newletters, social content and online presence at www.theshout.co.nz. Brought to you by New Zealand’s fasting-growing b2b and consumer publishing/events organisation – The Intermedia Group.